Last month, my family hosted two 15-year-old Chinese exchange students. The girls, Queena and Viola, arrived with an enthusiasm for PacSun, Kentucky Fried Chicken and — to our delight — cooking their local cuisine. They made Chinese food for my family several times during their two-week home stay, broadening our culinary horizons in the process. My 6-year-old daughter, Mira, and I accompanied the girls to 99 Asian Market Eatery in Burlington to get the ingredients they needed. Both of us were amazed by the wide assortment of interesting products we’d never seen before — exotic fruits, snacks and sauces, and dozens of noodle varieties. Queena and Viola introduced us to their home city’s signature dish, “Hot Pot,” a spicy stew used to cook thinly sliced meat and vegetables. They gave us four jars of “Old Mother,” a super-spicy condiment for rice and noodles with a photograph of a no-frills Chinese grandmother on the label. But my favorite Chinese culinary treat was the dumplings they made for us. The little pillows were stuffed with ground pork and finely chopped cabbage and mushrooms, then boiled or pan-fried. Weeks after the girls left, I still had dumplings on the brain. In a fit of late-night Googling, I realized dumpling wrappers can be stuffed with just about anything. After a lot of online food ogling, I decided to invite some friends over for dinner that weekend. We’d make dumplings with three fillings: chicken and veggies to appeal to the kids; red-curry shrimp geared toward the adults; and a decidedly non-Asian pea and ricotta, just for fun. Food prep that evening was a family affair. The Cuisinart food processor my husband and I got as a wedding present almost 10 years ago might as well have been a Tonka truck — my 3-year-old son, Theo, loved pushing the buttons and watching the food get sliced and diced at warp speed. And I hadn’t realized how closely Mira had observed our Chinese visitors. She filled and sealed the dumplings with aplomb, artfully pleating the wrappers as Queena and Viola had done. We steamed some of the dumplings in our rice cooker and pan-fried the rest. All were gobbled up by adults and kids alike. When it comes to family meals, it seems that going outside our comfort zone often has a delicious pay-off. Fill a medium saucepan with water and bring it to a boil. Add a few pinches of salt, then add the peas and cook until they turn bright green. This will take roughly 3-4 minutes for frozen peas, and less time for fresh ones. Drain the peas and run them under cold water for 1 minute to stop them from cooking. Use a food processor to purée the peas, ricotta cheese, olive oil and salt. Transfer the mixture to a big bowl and stir in the shallot or onion, Parmesan and lemon zest. Add more salt to taste. In a small skillet, heat 1 teaspoon of vegetable oil over medium-high heat. Add ginger and scallions. Stir until the scallions are slightly softened and mixture is fragrant, about 2 minutes. Remove from heat. In a food processor, pulse the shrimp until finely chopped. Transfer to a bowl and add the ginger mixture, curry paste, and fish sauce. Stir to combine. Place all the ingredients in a food processor and purée. 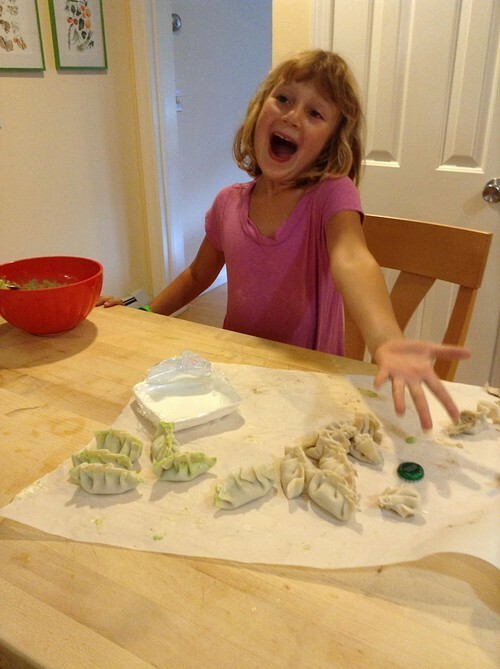 We used round Twin Marquis Dumpling Wrappers (Shanghai-Style) from 99 Asian Market Eatery to wrap our dumplings. There are different wrapping techniques. I moistened the tines of a fork with a bit of water to press the edges of the dumplings together. Mira folded and pinched the edges of the wrapper for “pleats.” There are many video tutorials on the web if you need direction. Don’t overstuff the dumplings or they’ll likely fall apart during cooking. A little dab of filling is all you need for one dumpling. 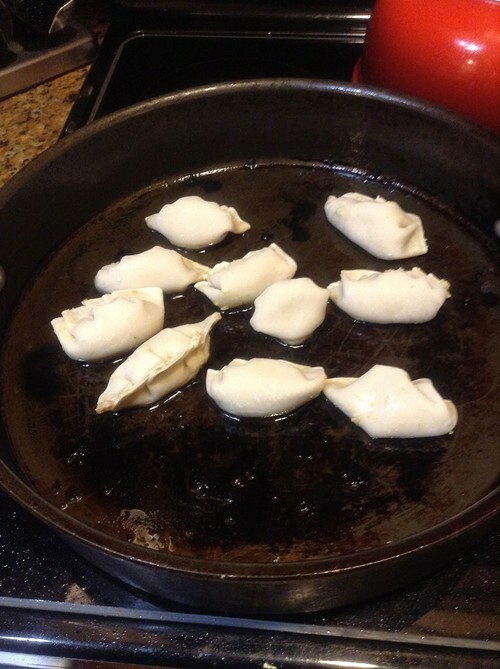 Before you start filling the dumplings, lay out a dozen or so wrappers on a piece of parchment paper. You can fill and seal them assembly-line-style for efficiency, and the speed will keep the wrappers from drying out. In a large skillet, heat a teaspoon of vegetable oil over medium heat. Cook the dumplings for about 8-10 minutes, flipping halfway through. We used the steamer basket/steam setting in our rice cooker but you can also use a bamboo or metal steamer basket sprayed with cooking oil. Brush each dumpling with a bit of vegetable or olive oil. Lay the dumplings in the steamer in a single layer, taking care not to overlap. Steam for 4-5 minutes, until the dumplings are translucent and tender. Combine the ingredients in a bowl. Divide into several small bowls and serve alongside the dumplings.